Welcome to Cheerleading.org, an online resource for cheerleaders and cheer coaches. Cheerleading is an incredible activity that combines leadership, athleticism, and entertainment, and millions of teens are passionate about it. Just like any other athletic activity, cheerleading fosters teamwork, dedication, and life skills that will prepare its participants for the challenges of adult life. But because of its unique leadership characteristics, cheerleaders get the added benefits of practicing communication skills, poise, crowd management as leaders at their schools. Today’s cheerleaders are athletes, scholars, and leaders. Ninety percent of cheerleaders are “B” students or better, 98.5% plan on going to college, and over half participate in other non athletic extra-curricular activities. Over half of all cheer teams participate in community charity events, 40% of cheerleaders participate in school sport outside of cheerleading, and many hold leadership positions in their class and in clubs at school. Cheerleading’s roots are closely tied to American football’s. The first intercollegiate game was played in 1869, between Princeton University and Rutgers University in New Jersey, and by the 1880s, Princeton had formed an all-male pep club. A graduate of Princeton, Thomas Peebles, took the Princeton cheers to the University of Minnesota, where football and fight songs were becoming very popular. In 1898, U of M was on a losing streak, and a medical student named Johnny Campbell assembled a group to energize the team and the crowd. Johnny picked up a megaphone and rallied the team to victory with the first organized cheer: “Rah, Rah, Rah! Ski-U-Mah! Hoo-Rah! Hoo-Rah! Varsity! Varsity! Minn-e-so-tah! Cheerleading grew from there. It wasn’t until 1923 that women were allowed to cheer for the first time, at the University of Minnesota. During this decade, cheerleaders added tumbling and acrobatics to their routines, and a University of Oregon cheerleader used flashcards for the first time. Although women were joining teams in the ‘20s, it wasn’t until the ‘40s that they joined in large numbers, since so many college-aged men went off to fight in World War II. 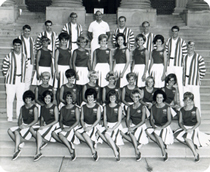 In 1948, Southern Methodist University cheerleader Lawrence “Herkie” Herkimer held the first summer cheerleading clinic at Sam Houston State Teacher’s College (now State University), and went on to develop his signature “Herkie” jump, the spirit stick and the pom pon, all cheerleading staples to this day. In 1961, he incorporated the National Cheerleaders Association (NCA). By the 1960s, cheerleading could be found in virtually every high school and grade school across the country, and pee wee and youth leagues had developed as well. In 1974, Jeff Webb (who had been general manager of NCA) founded Universal Cheerleaders Association (UCA), which taught higher level skills. The ‘80s decade brought the launch of many more event companies, as well as AACCA (American Association of Cheerleading Coaches and Administrators), in 1987, the first association devoted to teaching safety to coaches and advisors. UCA has grown into Varsity Spirit Corp., today, encompassing 17 cheerleading event, apparel and service companies. All-star cheerleading started in the late ‘80s, and grew rapidly through the ‘90s. All-star cheerleading focused on athletic training and competition performances, as opposed to school-based cheerleading, which still encompassed leadership and spirit qualities. Today, many companies offer both scholastic and all-star categories, and some companies focus primarily on all-star cheerleading. The original purpose of cheerleading is still relevant in today’s world, even with the increasing popularity of competition. Cheerleaders are the promoters of your school and community. They are a key marketing tool to the athletics programs that they support, and they create the community patriotism we call “school spirit.” Most importantly, they are tomorrow’s leaders who through the development of athletic skills, leadership, and teamwork will be vital members of the community in the future. Be a cheerleader and become a leader. Varsity Spirit Fashions is the world’s largest designer and manufacturer of cheerleading uniforms. Founded in 1979 by Jeff Webb, Varsity Spirit Fashions introduced a new, bold look in cheer uniform designs that complemented UCA™’s youthful, athletic image in the spirit industry. Uniforms by Varsity Fashions have been designed by cheerleaders for cheerleaders. Varsity Spirit Fashion™ uniforms blend athleticism with style by fusing the latest trends with technical fabrics and providing designs that combine classic, lean lines and fashion-conscious detail. Cheerleader & DanzTEAM is the original cheerleading supply company since 1948. The company was founded by Lawrence Herkimer who after his days at NCA, he began selling pom pon kits to local high schools. CDT had built a reputation of excellence and innovation in the spirit industry. Known for cutting edge styles and big, bold designs CDT uniforms are great cheerleading and dance uniform designs with a little bit of flash. Founded in 2006, Ozone has become the source for original All Star cheerleading uniforms for gyms across the country. Ozone cheer uniforms are one-of-a-kind and designed just for the competitive spirit of the teams who wear them. Ozone designers combine the team’s vision with a hint of creativity and skill to create a cheerleading uniform unlike no other. Universal Cheerleaders Association (UCA) was founded in 1974 by Jeff Webb with the goal of incorporating high-level athleticism with traditional crowd leadership. Today it’s the largest cheerleading camp company in the world training over 180,000 cheerleaders every summer at over 3,200 sessions across the country. UCA also founded and funded the American Association of Cheerleading Coaches and Administrators (AACCA), focusing on cheerleading safety. National Cheerleaders Association (NCA) was founded in 1948 by Lawrence Herkimer, AKA “Herkie.” His vision was to create an atmosphere where cheerleaders could learn all aspects of cheerleading by supporting their athletic teams and becoming ambassadors of their schools and community. Today NCA cheerleading camps are held in hundreds of locations nationwide, as well as private camps throughout the county. United Spirit Association (USA) was founded in 1950 by Robert Olmstead as “California Specialty Camps.” USA focuses on specialized instruction for all spirit, dance/drill, and band auxiliary activities with programs for cheerleaders, song leaders, pom and dance teams, drum majors, mascots, pep flags, drill teams leadership teams, advisors, directors and coaches. USA offers quality instruction and a creative environment where students can develop friendships and enjoy a positive learning environment. Universal Dance Association (UDA) began as dance camps founded by Jeff Webb and Kris Shepherd in 1980. UDA is the largest dance company in the country training over 40,000 dancers at camps in the summer at 760 camps across the country including private camps, technique camps, and choreography camps. National Dance Alliance (NDA) was founded in 1976 by Lawrence Herkimer and originally named NCA superstar. Now NCA offers a complete, well-rounded curriculum with choreography developed by industry leaders from across the country. Today’s camps are available at hundreds of locations nationwide as well as private camps. Cheerleading Technique Camps (CTC) was founded in 1991 by Jim Thorp with the vision of specializing in creating custom private camps for cheerleading teams. CTC’s goal is to hold cheer camps that are high-quality yet cost effective. American Cheerleaders Association (ACA) was founded in 1998 by Lance Wagers with the goal to go beyond ribbons and trophies and touch the heart of each participant. ACA prides itself on being able to offer a personal touch with quality as the center of its business. ACA also offers a leadership program to all campers and coaches. Spirit Express was conceived in 1992 by Don Collins to offer summer training to competitive cheerleading squads in a non-competitive learning environment. Camp focus is on skills training and is provided to meet a squad’s personal needs. American Cheer Power was started in 1985 by Regina Symons. The main focus of American Cheer power is on the athlete. Cheer Power offers camps that include private, stunt, choreography, youth, and the new cheer boot camp. The emphasis is on the athlete and his/her safety. V!ROC offers a one-stop shop for choreography at a very affordable rate. Founded by John Newby in 2006, V!ROC stands for Varsity! Remarkable, Original Choreography. V!ROC offers access to cheerleading and dance’s top choreographers. Spirit Cheer was founded in 1998 by Mark Pare. It provides reasonably priced private and specific skills-based camps for young people of all ages and abilities with a focus on “making it fun” for everyone. National Cheerleaders Association (NCA) was started by Lawrence “Herkie” Herkimer in 1948 and was the first organization to administer a competition for all star cheerleading in 1987. Today, the NCA All Star Championship is the most prestigious with more than 450 teams competing. NCA also runs the NCA Senior and Junior High School National Championship in Dallas, Texas and the NCA/NDA Collegiate Cheer and Dance National Championship in Daytona Beach, Florida. NCA Championships are broadcast nationwide on the Fox Sports Network (FSN). Universal Cheerleaders Association (UCA) was founded in 1974 by Jeff Webb and created the first actual national championship for cheerleaders in 1980, the National High School Cheerleading Championship (NHSCC). Today, UCA holds over 50 regional qualifiers leading up to the high school cheerleading competition, making it the most prestigious cheerleading national championship in the country. UCA also administers the College Cheerleading National Championship and the National All Star Cheerleading Championship held at the Walt Disney World Resort in Lake Buena Vista, Florida. All UCA Nationals are aired nationwide on ESPN and ESPN2. United Spirit Association (USA) was founded in 1950 by Robert Olmstead. USA holds five different competition events catering to all age groups, experience, and ability levels. These events include USA Junior Nationals, USA All Star Cheer and Dance Nationals, USA Dance/Drill Nationals, USA High School Spirit Nationals, and USA Collegiate Nationals. All USA Nationals take place in Anaheim and Los Angeles, California. National Dance Alliance (NDA) was founded in 1976 by Lawrence Herkimer, and the NDA National Championship was first held in 1985 as the NCA Superstar Pom Pon/Songleaders National Championship. Today the NDA National Championship is held in Orlando, Florida at the Hard Rock Live at Universal Citywalk. Universal Dance Association (UDA) was founded in 1980 by Jeff Webb and Kris Shepherd. UDA offers the widest variety of dance competition dates and locations throughout the US. Dance teams can compete in up to two categories at these dance championships including Jazz, Hip Hop, Pom, and High Kick. UDA created the National Dance Team Championship (NDTC) in 1985, and it’s now the largest dance team event of its kind. It’s held in Orlando, Florida and aired nationally on ESPN and ESPN2. American Cheerleaders Association (ACA) holds their two-day ACA Cheer Nationals in Fort Worth, Texas. ACA cheerleading competitions are known for their fair scoring and great customer service. Athletic Championships was started in 2002 by Mike Martinez and is the largest provider of two day cheer and dance national competitions. There is a no risk registration process with no late registration fees, no division change fees, and no cancellation fees. At these cheerleading competitions, cheerleaders get a choice of gifts and coaches receive a retro track jacket and attend free. The American Championships were founded by Jim Thorp and offer three different types of competitions: Regional events, State events, and National competitions. Events feature high-energy production, a first-class warm up area, a state-of-the-art judging system featuring video replay, jackets for all champions, and gifts for all competitors and coaches. All Star Challenge was founded in 2000 by Don Collins. Featuring uniquely themed professional sets at each location, these competitions are upbeat and showy. The judging system features an instant system that replays each routine after its competition. Over 50 “Outstanding Achievement Awards” are given at these cheerleading competitions. American Cheer Power was founded by Regina Symons in 1985 and now offers over 30 championships nationwide for teams and individuals with $60,000 in Cash Awards and Scholarships given away. There are three national championships in the south, northeast, and west through Cheer Power, along with an event that goes a step beyond nationals: The Tournament of Champions in the southeast. World Spirit Federation (WSF) was founded by Scott Foster with a goal to provide national competitions around the country. WSF prides itself on their digital scoring system which continues to set the standard for judging in the cheerleading industry. Spirit Sports was founded by well-known cheerleading coaches James Speed and Shannon Smith to provide a high-quality national championship at a reasonable price. Spirit Sports now runs two-day cheerleading national championships across the country. Spirit Xpress Cheerleading was founded in 1992 by Don Collins. This cheerleading company provides one day regional competitions primarily in North Carolina. Competitions are economically priced and offer one performance only. Spirit Cheer was founded in 1998 by Mike Pare. It began by creating “NBA Fun Days” for cheerleaders awarding the top team at the day’s competition the honor of performing as the half time entertainment for an NBA game. Today’s Spirit Cheer is known for producing cost effective and fun cheerleading events for all ages and abilities around the country. Founded by a group of 31 All Star industry leaders, including Varsity Brands, the International All-Levels Championship is the first cheerleading championship to let teams of all levels and sizes compete internationally. Over 160 Qualifying Events determine the teams competing at the All-Levels Championships where ultimately, one Grand Champion in each division is determined in a final, virtual round of competition on Varsity.com. Founded in 1988, American Association of Cheerleading Coaches and Administrators (AACCA) is a non-profit education association focused on spreading the word of cheerleading safety to the approximate70,000 cheerleading coaches across the United States. Members of the association include cheerleading coaches involved with youth cheer, junior high cheer, high school cheer, college cheer, and all star cheer. National cheerleading instructional companies from across the country are also dedicated to AACCA. The concept of the organization is to create strong, safer athletes, giving cheerleaders confidence, coaches knowledge, and parents a peaceful state of mind. The United All Star Federation’s (USASF) was formed in 2003 to maximize the number of participants benefiting from the positive experiences of all star cheerleading and dance by developing competition rules and all star gym training guidelines consistent with the latest best known safety, educational, and ethical practices. USASF hosts the World Cheerleading and Dance Championships held in Orlando, Florida in April. The Cheerleading and Dance Worlds is the highest level of competition for competitive cheerleaders and dancers. The International Cheer Union currently encompasses over 70 member nations and continues to grow as a unified voice for all those who are dedicated to the positive advancement of cheerleading throughout the world. The ICU is a non-profit international governing entity, and it has been properly and legally registered as such. Its mission and purpose are strictly to advance the sport. No corporations or individuals will benefit financially from it. The ICU is structured to provide balanced input and governance based on the various stages of development in which cheerleading finds itself across the globe. It serves as a powerful advocate for those who are truly dedicated to the advancement of cheerleading, and especially for the young athletes who participate. The USA Federation for Sport Cheering (USA Cheer) is a not-for profit 501 (c)(6) and is the national governing body for sport cheering. USA Cheer exists to serve the cheer community including club cheering (All Star) and traditional school-based cheerleading programs. USA cheer has three primary objectives: to help grow and develop interest in participation of cheer throughout the United States, promote safety and safety education for cheer in the United States, and represent the United States of America in the international cheerleading competitions. Sometimes as a cheerleader or dancer, you just can’t get enough of what you do! If you are one of the many cheerleaders and dancers who enjoy watching routine after routine on television, look no further than these top videos! From High School, to College, to All Star, to Dance – every cheerleading and dance video you want to see is right here! Varsity.com gives you high-quality professionally produced content, and thousands of competition and original cheer and dance programming. Holding the title of captain or officer of your cheerleading squad or dance team is a huge honor – not to mention a huge responsibility. You have to strive to become more responsible, be a leader, and act as a role model. This list will explain what is to be expected of you as captain or officer. Most cheerleaders would agree that approaching your coach about a problem can sometimes be intimidating. But, it’s important to know how to communicate with your coach, as you never know when you may need advice from him/her. Here are some great approaches to talking to your cheer coach. Coaching fees, competitions, camp, uniforms, and camp wear can get expensive over a year of cheerleading. That’s why it’s important for your team to fundraise! With these great ideas, your team’s bank account will be flowing with a little extra cash! Cheerleaders are more than just leaders on the football field. With so many young people looking up to cheerleaders, it’s important for a cheerleader to lead in the classroom, on campus, and in the community. Here you will find great advice on leadership for today’s athletes. Cheerleading practice is a time to learn cheers, perfect stunts, work on the pep rally you have coming up, and make that competition routine look effortless. Most cheerleaders will agree that cheerleading practice is no beauty contest – it’s a time to sweat and be active. Here are some tips on how to be practice-ready! For most cheerleading squads, a new year brings a new team. Seniors graduate and a whole new group of freshmen make the team. To have a successful squad, your team has to not just get along but actually be friends and become a family. Here are some team building tips that will have your squad bonding in no time! Whether it’s your first time or fifth time, cheerleading tryouts will always have your stomach turning with those nervous feelings. Will I learn the dance in time? Will I remember the cheer? Is my toe touch good enough? These may be questions you ask yourself before the big day, but you don’t have to be nervous! This guide to tryouts will have you ready for the big day with no more questions! No matter how good your toe touch, pike, or herkie is, there is always a way to get it a little higher, a little more hyper extended, and a little better all around. The answer is jump exercises. These tips will give you the best jump on your team! Is tumbling something you long to learn but can’t seem to stop fearing? It’s quite common to be scared when you are learning new skills, but the real secret is building up your technique and confidence. Once you have that – tumbling will be as easy as 5,6,7,8! Basketball is a game cheerleaders can take advantage of. From time-outs to free throws, there is always an appropriate time to perform a unique cheer or tradition in basketball. Use these ideas and take over the court! Getting fans to yell with you may seem like one of the biggest challenges as a cheerleader, but believe it or not, there are ways to get the crowd to yell with you and not at you. Here are some tips to getting the crowd to their feet! Your main goal as a cheerleader should be supporting your team and getting the crowd pumped up at games. Here are some guidelines on how to cheer at games and making your cheers crowd effective! Homecoming is a time of fun, school spirit, and to show appreciation to your school and the athletic teams. Make homecoming the best one yet with these Homecoming ideas for cheerleaders! Running out of new ways to promote spirit and support your school’s athletic teams? If you’re tired of just making locker decorations every week, here are some innovative ways to enhance your squad’s school spirit plan! While cheering for football and basketball are most common among cheerleaders, more cheerleading teams now are starting to support all of their athletic teams. From volleyball, to tennis, to baseball – there are several sports that are sometimes left off your spirit roster. This year, strive to support all teams! Pep rallies are many students, teachers, and fans favorite way to get pumped up for a big game. As a cheerleader, you play a big role in pep rallies. Whether you organize them or just cheer at them, these fresh ideas will get your crowd rowdy! Every school has them… traditions! Traditions are what make every school unique. Most schools have had the same traditions for several years! Here are some ideas for traditions from real schools! An all star dance team is comprised of dancers from different schools. Unlike school dance, these teams focus completely on competition. If you are interested in competitive dance, learn more about it here. The transition from high school dance to college dance can be a big change. Everything from tryouts to competition is different, but these guidelines will have you adjusted and ready to dance for your university! The words “twirl” and “jump” are just the beginning to the terminology you will need to know in dance. This A-Z Dance dictionary will have you speaking “dance” in no time! When starting out as a dancer, it’s important to recognize what makes a success. There are eight essential elements in dance. Read and learn them here. Being on a high school dance team can completely transform your high school experience. Before you set out on your venture to join a high school dance team, read over this guide so that you will know exactly what to expect! There is nothing more entertaining than a perfected dance routine. Toes pointed, jumps high, and your team in complete sync can make all the difference at competition. This article is all about perfecting your dance routine. As a dancer, strength and conditioning should be at the top of your list when it comes to practice. Here is a list of stretches and warm ups for you to do to avoid injury. Technique is the most crucial element in dance. Without it, your dance will come off looking flawed or sloppy. Whether it’s jazz, prom, hip hop, or kick, you should take an hour or more a day to work solely on technique. These stretches and warm ups will get you going. Want to be a Cheerleader? The focus of all star cheerleading is competition. Unlike high school cheerleading, there are no games, no pep rallies, and no spirit raising. If being an all star cheerleader is something you are considering, here’s what you can expect! There are many different aspects of being a college cheerleader compared to the good ole high school days. Know exactly what changes to expect with our college cheer guide that covers it all! Being a cheerleader in high school may be one of the best times in your life to cheer. Not only do you get the fun and carefree lifestyle of attending camps, hosting pep rallies, and leading games; you also get to experience leadership, responsibility, and what it’s like being a role model at a young age. Here’s a guide to high school cheerleading to get you prepared for one of the most fun times of your life! Cheerleading tryouts can be scary for anyone – especially someone who is trying out for the very first time. If you are a cheerleading newbie and are a little worked up about tryouts, follow these tips and you will be completely prepared for tryout day! Male cheerleaders are more than just a group of guys shouting cheers on the sidelines. Guy cheerleaders are actually what help cheerleading squads have more skillful stunts, higher baskets, and top notch pyramids. Maybe as a coach, you have thought of expanding your all-girl cheerleading team to a coed one. Here are some tips on recruiting guys to cheerleading. Are you a guy and have considered cheerleading? Maybe you are a female cheerleader and know a guy that you think would be great to join your team? Take this quiz and find out if he is really cheerleading material. While several male athletes are limited to predominantly male sports in high school such as football and baseball, a new trend has sparked the interest of a large number of them, particularly those athletes entering college: Cheerleading. For advice on how to become a male cheerleader, read this article! Have you ever wondered what goes through the head of a judge as your team take the floor? Maybe you want to know exactly what judges look for when scoring a team. We asked several judges those two questions, and here’s what they said! As a cheerleading advisor, one of your main jobs is to keep your cheerleaders safe. 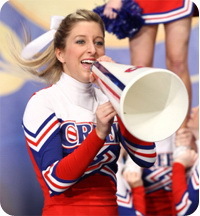 Read this guide on cheerleading safety and make sure your cheerleaders are up to par. Whether you are a base, back spot, or top girl, being safe when stunting is a must. Use this safety guide and follow it closely throughout the year. 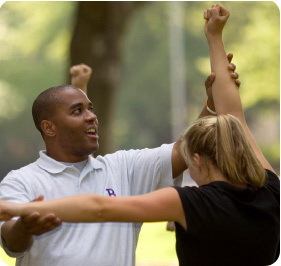 Your job as a cheerleading coach is to make your team a success. You want them to perform the best stunts and tumbling, but you also have to remember to keep their safety your number one priority. Here are some tips on how to be a top coach when it comes to safety! As a parent, you want your child to always be in good hands. When your child is a cheerleader, you may wonder if those hands she’s in are good ones! To be reassured, read this guide to parent’s safety. There is nothing wrong with a coach having a lot of questions when it comes to safety! Take a look at this list of FAQ, and have all of yours answered! Before the first day of tryouts begins, each potential candidate should know exactly what to expect from the upcoming season. A cheerleader constitution or contract will provide general information and goals of the program, as well as what is expected of individuals who wish to participate. Here are some ideas! An Emergency Plan is essential. Whether you are at a home game or away at a competition, anything can happen, and you have to be prepared for it. Use this as a guide to plan safely. It’s important for your team to fundraise. From camp, to competition, to uniform expenses, most parents will not be willing to pay all the fees that come with being a cheerleader. Fundraising will not only calm down parents, but it will show your cheerleaders what working for money is all about. As a coach, it’s your job to get your team pumped up about a new season. One way to do this is to set goals for the year. It will not only get your team ready for a new year, but it will give them something to strive for. Only learning the names of your cheerleaders or dancers won’t cut it throughout an entire year of coaching. It’s important to not only coach your team but become a part of their lives. Use these ideas to make an effort to get to know your team members one by one. Having an effective cheer practice is about more than trying to figure out who to put where in the routine. As a cheerleading coach, it’s imperative that you stay organized throughout the year by planning ahead and mapping out a schedule for your team. As a cheerleading coach, it’s important to remember that your team looks up to you as a mentor – someone to support them when they are facing difficult situations. Sometimes coaches are surprised to find that members of their team have negative body images. Teach them how to take care of and love their bodies! One of the most exciting times of the year is getting ready for camp. Your team is still getting to know each other as well as their skills and how they complement each other on the team. Here are some coaching tips to preparing for cheerleading camp! Cheerleading tryouts aren’t just a nerve-racking time for cheerleaders; they can also shake up the coaches a little bit. As a coach you may be asking yourself, what is my role in tryouts? What am I responsible for? This article will help get you on track to having a successful tryout! Thinking about becoming a mascot? Haven’t ever tried out before but think you would be the perfect Tiger, Bear, or Wildcat? 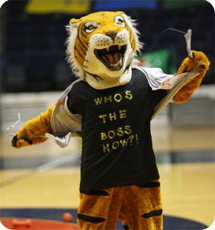 Use these ideas to be a success at your mascot tryout! Camp time for mascots is a time to learn new ideas while perfecting and showing off old ones. This year at camp, be the star mascot and stand out above the rest! Are you a mascot but in a slump for skit ideas? We have put together a list of real skits from real mascots. Use one of these ideas or build off of it and make it into your own personal mascot skit! Are you a high school cheerleader thinking about becoming a cheerleader in college? Sure, it may seem scary at first and though it can be a big change, if you love cheerleading, college cheerleading is the way to go! Here are some ideas on how to transition from high school cheer to college cheer with no trouble. As a cheerleading parent, getting involved in your child’s team is a great move, but there are boundaries. Read this advice for cheerleading parents and learn how to be the ideal cheer parent.